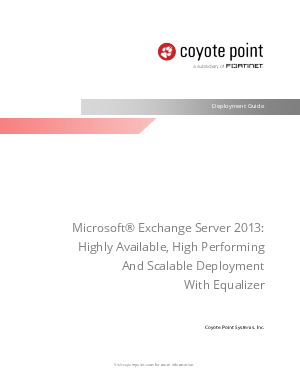 Microsoft® Exchange Server 2013 was released in late 2012 as the successor to Microsoft Exchange Server 2010. It introduced a number of new features as well as changes to existing features. This paper explores the limitations of Windows NLB and the benefits of deploying a hardware load balancing device to achieve optimum performance of MS Exchange 2013. Microsoft recognizes the need for load balancing client access in all but the smallest Exchange deployments. There are a number of hardware load balancing products available on the market with a wide range of features and capabilities. Equalizer differentiates itself by providing superior value; advanced acceleration features, high performance, and reliability born of over 10 years of industry experience.